Wind Waker meets Dark Souls An open world, action-adventure game with an emphasis on physics and player-choice, for PC, Mac and Linux. 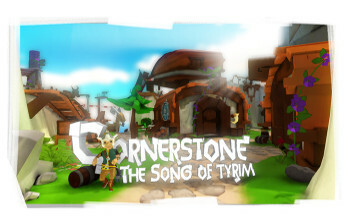 Cornerstone is an open world action adventure, with an emphasis on exploration and combat mixed with physics and player choice. A game inspired by The Legend of Zelda games and Dark souls. The world is structured similar to Wind-Waker with a series of islands connected within vast ocean, almost every areas is accessible from the start. The main method of transportation between islands will be by Ship (and don't worry, there will be fast travel). We’re aiming for an art style that invokes a sense of wonder but at the same time has the ability to charm your socks off. Stylized geometry with simple textures but with realistic rendering, and of course inspired by Viking culture. This looks and sounds awesome, I am seriously surprised it hasn't gotten more funding yet but with 7 days left it could still easily hit it. Looks like the graphics and gameplay are quite polished already, it's looking fantastic. They are sitting at nearly $19K and need a total of $30K to finish up. You can also help them for free by voting on their Steam greenlight page. This game deserves more attention from people!! It´s great to see they are supporting Linux, this game looks awesome!